The NFL’s new helmet rule got its first test on Thursday during the first preseason game of the year. 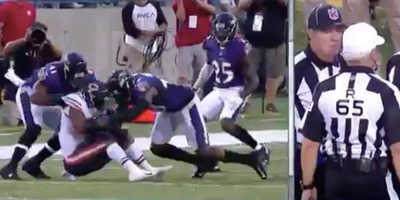 Baltimore Ravens linebacker Patrick Onwuasor was called for illegal use of helmet after leading with his head to bring down Chicago Bears running back Benny Cunningham. Football fans didn’t have to wait long to see how officials would be enforcing the NFL’s new rule regarding players who lead with their helmet. On Thursday, about four minutes into the opening game of the 2018 preseason between the Baltimore Ravens and the Chicago Bears, Ravens linebacker Patrick Onwuasor was called for illegal use of helmet after a tackle, resulting in a 15-yard penalty. Onwuasor did not seem out of control while bringing down Bears running back Benny Cunningham, though the replay showed he did put his head down ahead of contact, prompting the official to throw the flag. While it was put in place to make the sport safer, the use-of-helmet rule has caused headaches for players, coaches, and officials attempting to figure out just how it will be enforced. Officials’ efforts to clarify the rule are said to have fallen short – when the Philadelphia Eagles hosted referees for a presentation regarding it last month, players were apparently left with more questions than answers. Ultimately, as teams saw on Thursday, they will have to learn on the fly as the rule is enforced through the preseason and adjust to the officials’ tendencies as necessary.